« The flying Colors !!! Thanks to interests shown by many people in snakebite death mitigation and snake conservation, tragedies and stories on snakebites are being documented on social media quite regularly. The resulting discussions range from humanity, herpetological and medical grounds to Alternative treatments and treatment protocols. The below writing is to present facts and open up a can of worms on today’s scenario of snakebite venomation treatment in India. At present, the only treatment available for venomation due to snakebite in India is polyvalent antivenom, also commonly called as Anti Snake Venom Serum (ASVS). We do not have any other better options, either at the ground level or at a trial level or at the research level. We are completely ignorant of this fact , may be due to the complex nature of the problem or accepting snakebite deaths as natural calamity. Many of the states today compensate the victim’s family under the Natural Calamity Act taking these deaths as act of nature. The first antivenom development was started in the beginning of 19th century and for the last 100 years the basic concept of hyperimmunising horses still remains the same. 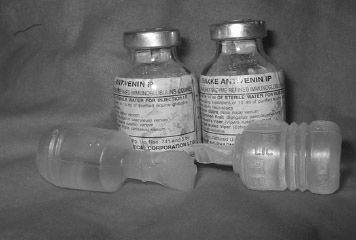 In India, around 1928, venom extraction started at Haffkine Institute. Hence, we can say that antivenom development must have started around the same time. First developed antivenoms were monovalent, that means the venom of a single species was used to hyperimmunise the horses and therefore it neutralised the venom of the same species only. That is how our first medical guidelines came into practice, which made people to bring the snake dead or alive so that right antivenom could be given. But ground realities were very different, in most situations it was impossible to know which species had bitten the victim, and thus polyvalent antivenom was developed in due course. This was produced by hyperimmunising the horses by pooling two or more venoms from different species and thus the resulting antivenom could neutralise venoms of those species that were used for the production of antivenom. There is one school of thought that thinks monovalent antivenoms are better than polyvalent antivenom for management of venomation cases. Let’s discuss this subject with reference to the ground realities, keeping it’s scientific value aside. The advantages with monovalent antivenom are that it acts faster and needs less quantity to be administered than the polyvalent antivenom. However, the major disadvantage, as in the past, is correctly identifying the species of snake that is responsible for the bite. Another challenge will be the production of monovalent antivenom for all medically important species and storing the same at every Public Health Centre. Polyvalent antivenom, though slower and may need more in quantity, solves challenges at the ground level. One does not need to know what species has bitten the victim or doesn’t need to get snake for identification before treatment. Thus, we can move the medical fraternity from a species diagnosis to a symptom diagnosis process. This approach helps in initiating the treatment faster instead of wasting time in identifying the snake. During my interaction with doctors at the Primary Health Centre level, it has been understood that identification of the snake has been the foremost challenge to work on snakebite treatments. This becomes even more difficult with the absence of any standardised snakebite treatment protocol, leading to lack of confidence amongst doctors to accept and treat cases at the village level. So presently, our ground realities favour the polyvalent antivenom. Our biggest problem today is efficacy of the present polyvalent antivenom. Presently available polyvalent antivenom acts against four commonly found venomous snakes in most parts of India. Those are Binocellate cobra Naja naja, Common Krait Bungarus caeruleus, Russell’s viper Daboia russelii and Saw-scaled viper Echis carinatus. This polyvalent antivenom may not show efficacy against medically important snakes found in Eastern and Northeastern region of India where species dynamics is completely different. In some geographies, few medically important species are different than those considered in the above big four. The present polyvalent antivenom may not be useful in those geographies. Therefore, the better way is to geographically map the species dynamics and define medically important species regionally and work towards polyvalent antivenom specific to a particular region. To make matters more complicated, it has been observed that same species show geographical variation in their venoms, so the present polyvalent antivenom, which in majority of the cases use South Indian snake venoms for hyperimmunization, have shown limitation with it’s efficacy. So what we need is a polyvalent antivenom specific to a region and produced from the venoms of snakes found in the same region. Presently, to think beyond existing polyvalent antivenom is a farfetched dream, as our country has not done any research either on venoms of different snake species or on new antivenoms. Barring efforts done by MCBT under venom project and the recently launched collaborative efforts by herpetologists in some pockets, our research community as well as academia has not shown much interest in doing research on venoms & antivenoms. Even countries like Costa Rica & Papua New Guinea has done substantial work on better antivenom production, while many developed countries have gone miles ahead on venom research and its therapeutic value. To undertake such research and sampling, there are permissions needed from various authorities under Wildlife Protection Act, and these are not easy to come by. Those handful of people who have shown interest and made efforts to work towards it are still fighting for permissions and funding, since institutionalised support and collaboration from research Institutes are as difficult as those permissions from the forest departments. And for first time I can say that I don’t blame any politician for the state of affairs but the blame completely goes to our research community for not showing ambition or interest to undertake wide scale venom research and work towards better antivenom. With laws controlling the use of animals for extracting venoms / production of antivenom and lack of interest at national level for more research, the only way forward is to get someone who can move the magic wand and get a Ministry of Environment and Forests to launch a central guideline, that makes permissions for venom sampling and extraction a responsible but easier affair. With this background and scalability issues, my personal opinion is to develop a region-wise polyvalent antivenom produced from snake venoms of the same geography. Recently, under the ‘Living with Snakes’ banner, an initiative has started for mapping of venomous snakes across India that will give us the basic data on species diversity, and help us achieve the region specific polyvalent antivenom. Polyvalent antivenom with all its limitation and risks. Absence of standard treatment protocol. Near zero research on venoms and antivenoms. So, the best thing at the moment is not to get bitten!!!!!!!!! This entry was posted in Blog, Snakes and tagged antivenom, bites, cobra, conflict, fatal, snake, snakebite, venom. Perfect elaboration, the need of time . Thanks for sharing your thoughts ! One year and still there!!! Be Aware & Make Aware – You can save a life!!! !